This recipe book should be a must read for every family. You'll find every imaginable recipe you'll ever need for small family dinners or large party gatherings.Start with appetizers, soups and salads. Enjoy mouth watering "home plates" (entrees) served with delicious sides and unforgettable breads. And don't forget dessert! My personal favorite recipes are Katherine's Shepherd's Pie, Enormous Popovers and Shoofly Pie. The book cover of this beautifully illustrated book says "recipes you remember and love" - no doubt YOU will be remembered the first time you serve one of these dishes! I loved the Heirloom Baking cookbook so much that I wanted to try this one out too. My dad obliged and got this for me for Christmas. This book is great because it ties in history and cooking. There are some kooky things in here but many of the recipes are simple and delicious. I especially love the stuffed mushrooms (which I make without cheese since my husband isn't a fan) and the zucchini bake which go over very well at parties. I plan to try some of the more complex recipes out for special occasions. The Canadian Banana Bread was a huge hit with our Hindu housemate, Jaya, who cannot eat eggs. I taught her how to make it and she took it to the office. There were many requests for copies of the recipe from the Madison Indian community. These are COMFORT food recipes--traditional and tasty. Not as good as the Heirloom Baking book, this one was fun to read and then return to the library.If you don't have an extensive recipe or cookbook collection or if you're not blessed with an amazing Mom and Aunt as your cooks of inspiration, this will be a good fit for you. Charming (at times) cookbook with a lot of old (and sometimes nasty) recipes that I have seen previously. And some I really never wanted to see again....Candle salad - banana, pineapple ring, cherry - that does not need to be resurrected. Another winner!! This one would probably get more use than the baking book. Recipes have too many ingredients for me to consider trying. Not my style of eating or cooking. 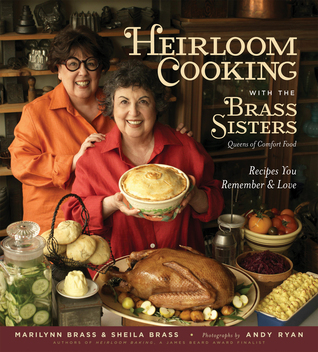 Marilynn Brass Sheila Brass - MARILYNN AND SHEILA BRASS are the authors of Heirloom Cooking with The Brass Sisters and Heirloom Baking with The Brass Sisters, a finalist for the James Beard Award. They have hosted their own specials on PBS and the Cooking Channel; have appeared on Throwdown with Bobby Flay and on PBS's Simply Ming. They appear regularly on NPR's All Things Considered - Found Recipes and the NPR blog, The Salt. They live in Cambridge, MA and enjoy baking with their family and friends in their home kitchen.